We hope this is only the beginning and even more students across the state will be inspired to share their stories and perspectives on the positive benefits and experiences of high school sports and activities. 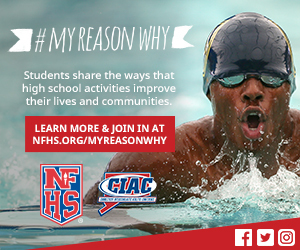 Students can submit their stories at nfhs.org/myreasonwhy and share their perspective on social media using the hashtag #MyReasonWhy. You can also submit your stories to jcookson casciac org and the CIAC will share them as well. Let’s spread the word on all the great stories in the world of high school sports in Connecticut.